Works with the M3 Button head screw. This bracket has a 1/4" (6.4mm) clearance hole. Stainless steel M3 X 5mm long. Set of 4 standoffs with washers. Sized for small boards such as arduino. For boards with 1/8" holes. Clears components close to mounting holes. 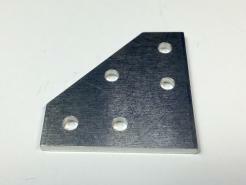 The hinge axis is centered on the edge of the profile. This joint has 180 degrees of rotation. Bushing supports 3mm OD shafting. Requires two for a complete joint. The knuckle hinge allows end-to-end pivoting of profiles. +/- 90 degrees of rotation. Bushing works with 3mm OD shafting. Need 2 to build a complete knuckle. Set screw package of 24 with hex key. Simple bracket lets you attach MicroRAX to photographic accesories with 1/4"-20 male threads. 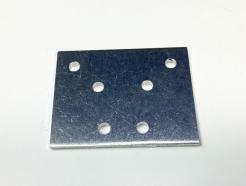 Includes two single hole nut plates, screws and washers. 1/4/2018 CURRENTLY BEING CUT TO ORDER. PLEASE ALLOW 5 BUSINESS DAYS FOR PROCESSING. See details for part listing.